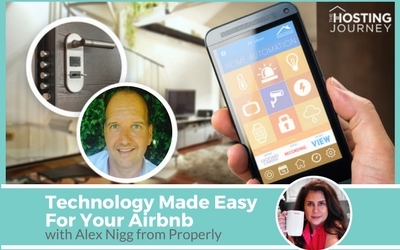 “Technology Made Easy For Your Airbnb” with Alex Nigg, Properly Founder, Tech Expert and Airbnb Superhost! This episode will teach you how to use simple technology to create an amazing experience for your guests and SAVE YOU MONEY! We discuss smart locks, Nest Thermostats, plus other easy ways to automate your listing to add efficiency, comfort, and CASH in your pocket. The technology you and guests will LOVE! Simple, uncomplicated, BETTER! Bring YOUR home into the 21st century with “Technology Made Easy for Your Airbnb”. It’s the wave of the future.